In the January issue of Public Works magazine, writer Victoria K. Sicaras declared that public works departments are finally inching toward economic recovery. While tax revenue is slowly on the rise, complete financial recovery for municipal public works departments has yet to become a reality. The magazine’s annual funding survey polled over 500 public works officials across the country. Survey questions addressed budgets for the 2015 fiscal year, the biggest challenges facing public works departments, and the general perception of ease or difficulty as compared to 2014. More than half of all respondents believed that overall, 2015 would be about the same as 2014. This outlook was supported by the nearly half who reported that their 2015 budgets remained the same as their 2014 budgets. Pipeline maintenance and rehabilitation, erosion control, and infrastructure management best practices ranked in the top 66% of biggest challenges facing public works departments in 2015. Years of neglect and general wear and tear have left pipes, drains, and culverts in unfortunate conditions; the lack of funds to address these infrastructure woes has only caused them to worsen. Fortunately, there are ways to save money when addressing decaying infrastructure, like avoiding the time and expense associated with excavation. Uretek Mid-Atlantic has solved a variety of infrastructure problems with minimally invasive techniques. 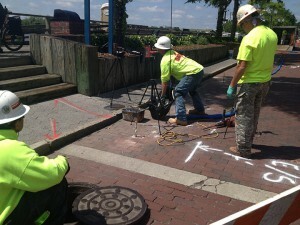 See the Public Works funding poll here.